The Adventures of a Foreign Salaryman in Tokyo: Well, if he's getting some, you really have no excuse! Well, if he's getting some, you really have no excuse! So, after some adventures in the east coast of the US, I now finally find myself back at the Salaryman HQ in rural Chiba. The jetlag that the trip has given me is of monumental proportions and at 3AM this morning I found myself wide awake and promptly got up to sit and drink coffee in the darkness. 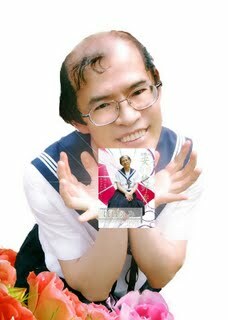 During my absence, there is one quite interesting piece of news that I picked up on my return and it's related to our favorite Wig-Helmet guy, Nishiyama (aka Nobita-kun) and his personal romantic life... Apparently, last week, he was found to have "improper" relations with a lady in her early 30's in the ministry, kissing and fondling her in public in the workplace and as punishment was promtly put on a one month forced leave of absence. As I checked the news out, I also realized that I had missed a similar incident in June where he had been found to have improper relations with an assistant at work and was removed from the position of spokesman. There is nothing that implies that these "improper" relations and public displays of kissing and fondling were of anything but mutual nature I must admit that I feel quite impressed with our little Nobita-kun's virility and success with the ladies. He is of course married as well so he's quite the busy little beaver juggling the young girls, work and family life! So there you have it, there really is no excuse for you, if Nobita-kun can get some with the young girls, there really is no reason why you shouldn't either! But I can't help but wondering how he handles the wig-helmet during an intense session of love-making with one of his younger energetic girls? Does he place it on a hanger before, revealing his true nature or does he keep it on, desperately trying to keep it in place during the act? Much to contemplate indeed. Thanks for the wonderful mental image that will take months to erase, a wig on a hanger is every woman's dream. No wonder Japan is in such a state! Maybe some sort of glue is involved? Or maybe a suction pad? "3AM this morning I found myself wide awake and promptly got up to sit and drink coffee in the darkness." He probably uses sock glue. Why do men think it's cool to cheat on their wives? it's the oozing testosterone that called for a wig to begin with! The man is a playa. What I don't get is why he got in trouble and not the women? Aren't they being just as inappropriate? Saraf - But maybe, just maybe he actually brings one of those head shaped wig holders for these sessions? Would that make you feel better about it perhaps? Octopus - Both I would wager! Chris - Huh? What was it we were talking about again? Persian - Well, not sure if anyone thinks old "Nobita-kun" is cool in any sense of the word? BiJ - For real, he's a real pimp and the girls at the ministry are all his hoes to manage!